“Curiouser and curiouser!” Cried Alice. Here is a curious thing. Since 2007 our population has risen by what seems a healthy 14.8%, our emissions of carbon dioxide are out of step in rising only by 2.8% and our per capita emissions have fallen by 10%. Our energy efficiency has improved. Demonstrating leadership to the world is accomplished. Trouble neither our farmers nor our poor. Our poor will be poorer should we fail to flourish. Trust our farmers to retain their hard-won efficiency. Let energy prices fall where they will. Let energy be found when we need it. You have confirmed that reducing per capita CO2 emissions need not reduce productivity. Efficiency gains persist and there are still more to be found. The marginal cost of renewables is almost zero once the infrastructure is in place. reducing per capita CO2 emissions need not reduce productivity. Efficiency gains persist and there are still more to be found. You cannot confirm there are more to be found, you just hope there are more. The marginal cost of renewables is almost zero once the infrastructure is in place. Considering: the CO2 emitted in manufacturing solar panels, wind turbines and EVs; the lakes of poisonous effluent being created in mining the rare earth metals required for generators and motors; the CO2 emitted in producing the cement, steel, plastics and transmission equipment, and the hydrocarbons required in transporting, erecting, lubricating, servicing and decommissioning these leviathans, their cost will be and remain far in excess of all other forms of generation, while their environmental impacts will be brutal. When all these are finally tallied objectively and become widely known, bully-boy lobbyists like you will be reviled—laymen and scientists alike. Hydro is good because it is both renewable and dispatchable – i.e you can turn it on and off at will – like peak load gas turbine plants. Wind and solar are not dispatchable, so require backup plant for when the wind isn’t blowing or the sun isn’t shining. Diesel, eh? Not a cheap option. On the contrary, as people see heatwaves every couple of years, disastrous droughts, catastrophic fires followed by floods everyone except the insane will see the scientists were right. The world is moving to renewables. It will take time and there will be hiccups. Hiccups we can deal with but time is running out. Here you present summaries of distinctly radical predictions of four aspects of climate. Many sceptics like to evaluate predictions of climate like these against trustworthy sources rather than take them at face value. Such a study often begins in a comparison with current conditions, so I had a look at what the IPCC said in Managing the Risks of Extreme Events and Disasters to Advance Climate Change Adaptation (SREX), a handy compendium of recent climate, published in 2012. The following comments are from the SPM. In many (but not all) regions over the globe with sufficient data, there is medium confidence that the length or number of warm spells or heat waves has increased. There is medium confidence that some regions of the world have experienced more intense and longer droughts, in particular in southern Europe and West Africa, but in some regions droughts have become less frequent, less intense, or shorter, for example, in central North America and northwestern Australia. Though these are made more likely by the weather, the weather does not cause them. They’re commonly caused by arson, for example in Greece last week [that was me, not the IPCC – RT]. There is limited to medium evidence available to assess climate-driven observed changes in the magnitude and frequency of floods at regional scales because the available instrumental records of floods at gauge stations are limited in space and time, and because of confounding effects of changes in land use and engineering. Furthermore, there is low agreement in this evidence, and thus overall low confidence at the global scale regarding even the sign of these changes. For many years, those seeking to justify carbon restrictions argued that hurricanes had become more common and intense. That hasn’t happened. Scientific assessments, including those of the Intergovernmental Panel on Climate Change and the U.S. government’s latest National Climate Assessment, indicate no long-term increases in the frequency or strength of hurricanes in the U.S. Neither has there been an increase in floods, droughts and tornadoes, though heat waves and heavy precipitation have become more common. Prior to Harvey, which made landfall as a Category 4 storm, the U.S. had gone a remarkable 12 years without being hit by a hurricane of Category 3 strength or stronger. Since 1970 the U.S. has only seen four hurricanes of Category 4 or 5 strength. In the previous 47 years, the country was struck by 14 such storms. President Obama presided over the lowest rate of hurricane landfalls—0.5 a year—of any president since at least 1900. Eight presidents dealt with more than two a year, but George W. Bush (18 storms) is the only one to have done so since Lyndon B. Johnson. The rest occurred before 1960. Without data to support their wilder claims, climate partisans have now resorted to shouting that every extreme weather event was somehow “made worse” by the emission of greenhouse gases. The matter of what might happen in an unpredictable climate in the 82 years before the end of the century is deeply uncertain, though it’s highly likely to be similar to the last hundred years and unlikely to be much influenced by CO2, a trace gas constituting a mere 0.0004 of the atmosphere and emitted by us in puny quantities. That likelihood declines when you consider that the amount of atmospheric water and water vapour is about 100 times greater than CO2, water has one of the greatest heat capacities we know of, it absorbs heat in all three forms and in evaporating draws heat energy from the ocean and atmosphere like a great sucky monster that has kept the temperature within narrow bounds for half a billion years. Your last paragraph is nonsense Richard. Easy to say, hard to refute, though I’d like you to try. Only, don’t waste my time with 45-minute presentations. Just give it to me in your own words, if you can remember what Prof. Allen says. All you have to do is get to Slide 20 Richard. The key point is that CO2 is the dominant greenhouse gas at the at the altitudes and wavelengths that radiation escapes to space. This stuff is not hard Richard, it’s been well understood for over 120 years. The world has warmed more than one degree Celsius since the Industrial Revolution. The Paris climate agreement — the nonbinding, unenforceable and already unheeded treaty signed on Earth Day in 2016 — hoped to restrict warming to two degrees. The odds of succeeding, according to a recent study based on current emissions trends, are one in 20. If by some miracle we are able to limit warming to two degrees, we will only have to negotiate the extinction of the world’s tropical reefs, sea-level rise of several meters and the abandonment of the Persian Gulf. The climate scientist James Hansen has called two-degree warming “a prescription for long-term disaster.” Long-term disaster is now the best-case scenario. Three-degree warming is a prescription for short-term disaster: forests in the Arctic and the loss of most coastal cities. Robert Watson, a former director of the United Nations Intergovernmental Panel on Climate Change, has argued that three-degree warming is the realistic minimum. Four degrees: Europe in permanent drought; vast areas of China, India and Bangladesh claimed by desert; Polynesia swallowed by the sea; the Colorado River thinned to a trickle; the American Southwest largely uninhabitable. The prospect of a five-degree warming has prompted some of the world’s leading climate scientists to warn of the end of human civilization. Is it a comfort or a curse, the knowledge that we could have avoided all this? Because in the decade that ran from 1979 to 1989, we had an excellent opportunity to solve the climate crisis. The world’s major powers came within several signatures of endorsing a binding, global framework to reduce carbon emissions — far closer than we’ve come since. During those years, the conditions for success could not have been more favorable. The obstacles we blame for our current inaction had yet to emerge. Almost nothing stood in our way — nothing except ourselves. You climate deniers have no idea what you are talking about. The global community of scientists is not wrong. The evidence is overwhelming. Without prompt mitigation, man is going to lose his place on Earth. From past observations and models we find that the probability of such a heatwave to occur has increased everywhere in this region due to anthropogenic climate change, although in Scandinavia this increase was not visible in observations until now due to the very variable summer weather. We estimate that the probability to have such a heat or higher is generally more than two times higher today than if human activities had not altered climate. Due to the underlying warming trend even record breaking events can be not very extreme but have relatively low return times in the current climate. Here we present an attribution study of the ongoing heat wave made in near real time using well assessed methodologies. It is not peer-reviewed and was written quickly. We used thoroughly tested methods to do the analysis, evaluation of models and checked the observations for errors. The return times are partly based on forecasts and therefore have additional uncertainties. However, the changes in probability are based on past observations and model results, and the authors are confident that these results are robust. We are very grateful to Peter Thorne and Peter Thejll for making the Irish (from Met Eiréann) and Danish (from DMI) temperature observations available to us. Carbon dioxide is 0,04% of the atmosphere and is the most important greenhouse gas. Why? Think. Earth would not be +15C without the greenhouse effect. It would be -18C. How much water vapour would there be? Mr Treadgold. Say there are 60,000 scientists publishing in the scientific literature. Experts. Some have spent a lifetime studying climate science. You know nothing and expect to be taught in 5 minutes. The science is changing every month. Your views are wrong. Total nonsense in fact. Carbon dioxide is 0,04% of the atmosphere and is the most important greenhouse gas. Yes, as I said, it’s a trace gas. How is it the most important and why? I’m interested in how much water vapour you think there would be; there’s no evidence so far that atmospheric water vapour correlates with surface temperature. The evidence from a little higher shows that WV has declined over several decades. You say my views are wrong. Fair enough. So refute them. How can I turn to something else if you don’t? http://www.eci.ox.ac.uk/news/2018/0410.html explains why CO2 is the most important. Why are you still denying the water vapour feedback mechanism? Warmer air is capable of holding more water vapour. Think back to your sixth form chemistry experiments. How much water vapour do you think is contained in the atmosphere above the permanently cold dry valleys of Antarctica? Indeed, the WV RH must keep pace with any rising T, in order for the CAGW to be occuring. As the tropical hotspot must warm, they being linked. But that is part of what Warmista must prove, and they cannot. End of story, that would be if we were dealing with honest folk……….? Quite laughable to see failed Court arguments used in CAGW’s favour. As with Monckton’s brilliant trap, they walked into it and lack the noos to know it. Winning is such fun, but it does feel a bit like poking retards with sticks in this case. If only they were not such dangerous and nasty little beasts, I would refrain out of pity. The AMOC is about to bite them on the rear end. Many more folk will die because warmists raised power prices fo no good reason. That is set in stone now, and there will be a price. Settles it? They already said it was settled. Oh, yes, I get it. I thought my response was suitably Lewis Carroll-esque for the post. It suits, suitably suitable indeed, as always. Is this the same James Hanson that said in 30 years time we will all be toast, 30 years ago? The green flop poisoning those it does not manage to freeze. Treadgold, you know nothing about climate science. Do you know any science at all? What science is, how it works? CO2 is the key greenhouse gas. Changes in the Sun and orbits may trigger temperature changes but CO2 controls the temperature on Earth, via the greenhouse effect. That is standard science. Only deniers disbelieve it. Earth is retaining more energy as the CO2 level rises. Some areas are much much hotter. You just ignore the evidence rational people accept. You would claim you were sucking an ice-block if someone stuck a red-hot poker up your rrrs. Actually, not as much as you make out. According to NASA, 70% of the net heat energy emitted by the earth (which is 17% of incoming solar insolation) escapes directly to space. As the surface warms, the emission of heat increases by the fourth power, which is a pretty significant increase. The heat energy is well able to leave the planet. This is obvious to all: on a cold clear morning following a warm spell the temperatures plummet immediately. Only about 5% of the incoming solar insolation is actually affected at all by GHG when leaving. Of that, less than half actually affects the surface temperature, since most is re-emitted either upwards or sideways, and eventually to space. So in theory, yes, GHGs absorb IR energy in the lab, but the dynamics of our planet are much more complex than just assuming that heat energy is “trapped”. Convection and evaporation together transfer far more energy from the surface (think oceans here, not land) than is absorbed by GHGs. We don’t actually know in detail just how the balance is changed by perturbations in the system. For example, is an increased level of CO2 simply ignored by the system, since there are plenty of other pathways (direct and indirect) to shed heat? This is why it is openly acknowledged by James Hansen that the climate sensitivity is simply unknown, and he employed his best guesses in his models. He spends considerable time in his papers discussing the effects of different values of the CS. And of course different CS values have significant effects on predictions of the power of CO2 to influence the future temperatures of the earth. The albedo change due to a 1 or 2% change in global cloud cover (yes, it varies) can completely dominate the small effect of CO2 GHG. Why? Well, the incoming insolation is immediately reflected away, resulting in an overall cooling effect. The energy never makes it to the surface in the first place. We don’t yet fully understand the solar cycle length – temperature relationship, but it exists. Same for the sunspot – temperature relationship. In fact, the only thing we’re absolutely certain of in the CO2 – temperature relationship is that CO2 lags temperature by up to hundreds of years. You can check this for yourself by downloading the Vostok ice core data, as I did. This is the opposite of the expected relationship, if CO2 controls temperature. Nevertheless, it makes perfect sense, once you work out that the oceans give off more CO2 when they’re warmer, and absorb it again when cooler. What’s interesting in the core data is how often, at a CO2 peak (once CO2 has caught up) the ocean temperature suddenly dives right down while CO2 is high. Now according to AGW theory, this can’t happen, since the high levels of CO2 should control the temperature and stop it cooling abruptly. So no, this is not settled science. In fact far from it. That’s entirely unfair. I asked you to explain why carbon dioxide is the most important greenhouse gas, but you wandered off to ask a hypothetical question about water vapour levels at -18 °C. I have no idea, so I gave in and asked you to tell me; so tell me. By the way, temperature increases at the bottom of a 100 km column of gas, quite apart from any GHG effect. I ask again: why is CO2 the most important GHG? You regurgitate the astonishing claim that CO2 “controls” the temperature on Earth, but you don’t explain how this is possible, you provide no correlation of CO2 with temperature, you actually refuse to discuss positive evidence that there’s no correlation, you refuse to see the enormous effect of water and its vapour on temperature and you have the cheek to reward those who politely ask why you say these things with the deeply abusive appellation “denier”. Please show evidence of the correlation between global average surface temperature and atmospheric water vapour. It’s well understood — there must be evidence of it. But, see, the record of relative humidity and total column water vapour since about the 1950s shows they’re reducing, so that’s a mystery, for a start. That’s why I struggle to believe you on this. [Professor Allen waffling to a court, even the judge got bored] explains why CO2 is the most important [greenhouse gas]. Explain it in your own words. I missed your analysis while engrossed in writing, then refreshed my browser and wham! Thanks for an informative contribution. Regarding the sudden dive in ocean temps while CO2 is high: do you think that might be caused by higher cloud cover when it’s warmer? I’ve no idea, but it could be. You’d have to show correlation between high temps and cloud cover as a start, but I don’t think it’s the case. What I do know is that whatever else is driving the planetary temperature variations in the historical Vostok data, CO2 is the follower, not the leader. The other thing we know about Vostok is that Al Gore used it in his movie to “prove” that CO2 was a driver of climate. Anyone familiar with Dennis Horne’s & William of Ockham’s invective can see that Stephanie Hawking is just another false front for Dennis’ venom. That’s right, and I believe James Hansen was the scientific consultant on that movie. They knew already in 2003 that CO2 lags temperature, but why ruin a good story? So you’ll notice Gore uses carefully-scripted phrasing in the movie. He implies they “fit together” without explicitly stating that CO2 leads temperature in his chart, which they all knew it didn’t. It’s a monumental disgrace—despoiling the planet for the sake of the planet. Stephanie Hawking is just another false front for Dennis’ venom. Sure, but just as on the Internet nobody knows you’re a dog, neither can anyone prove you’re a dog. Thus I hesitate to call Stephanie Dennis. He implies they “fit together” without explicitly stating that CO2 leads temperature in his chart, which they all knew it didn’t. The initial changes in temperature during [the Vostok ice core records during the past 400,000 years] are explained by changes in the Earth’s orbit around the sun, which affect the amount of seasonal sunlight reaching the Earth’s surface. In the case of warming, the lag between temperature and CO2 is explained as follows: as ocean temperatures rise, oceans release CO2 into the atmosphere. In turn, this release amplifies the warming trend, leading to yet more CO2 being released. In other words, increasing CO2 levels become both the cause and effect of further warming. This positive feedback is necessary to trigger the shifts between glacials and interglacials as the effect of orbital changes is too weak to cause such variation. Additional positive feedbacks which play an important role in this process include other greenhouse gases, and changes in ice sheet cover and vegetation patterns. The warmsters might like to consider employing the lag to explain the lack of significant warming caused by our enormous emissions of CO2 during the recent hiatus, or their case is weakened. In turn, this release amplifies the warming trend, leading to yet more CO2 being released. In other words, increasing CO2 levels become both the cause and effect of further warming. OK, so now they must please explain how the temperature suddenly dives down in spite of the high CO2. Temperature utterly ignores this super climate knob that supposedly drives it. It simply drops like a stone, leaving CO2 to follow it later. In other words, there can not be causation between CO2 and temperature if temperature is unaffected by CO2. On Earth, an atmosphere containing naturally occurring amounts of greenhouse gases causes air temperature near the surface to be warmer by about 33 °C (59 °F) than it would be in their absence. Without the Earth’s atmosphere, the Earth’s average temperature would be well below the freezing temperature of water. The major greenhouse gases are water vapour, which causes about 36–70% of the greenhouse effect; carbon dioxide (CO2), which causes 9–26%; methane (CH4), which causes 4–9%; and ozone (O3), which causes 3–7%. Clouds also affect the radiation balance through cloud forcings similar to greenhouse gases. NOTE TO STEPHANIE: Water vapour is listed as responsible for up to 70% of the greenhouse effect, CO2 for up to 26%. Ergo, the most important greenhouse gas is not CO2 but water vapour. But, Bob, it shows unequivocally that CO2 warms the atmosphere. True, it doesn’t describe a mechanism, but I’m hoping that won’t spoil the nice argument I’m making, since there must be a mechanism, following the confirmation by Arrhenius. In 1896. There’s more info in Wikipedia under Greenhouse Effect but now I make some soup. I’ll look later. Feedbacks work both ways Bob. If something causes the oceans to cool, they can then absorb more CO2 and the cooler atmosphere potentially holds less water vapour as well. This is the first time that there has been a species that emits CO2 in large quantities. There have been large scale combustion events and methane releases in the past but they have tended to be one-offs. Time for you to read up on climate sensitivities, there is a huge body of work there. There is high confidence that the ECS is somewhere in the range of 1.5 to 4.5 °C. CO2 in the “lab” quite definitely causes warming, yes. But, as per my argument above, we have actual proof, via Vostok, that our global climate system does not respond as simply as in the lab. There are other avenues available for heat-shedding, such that CO2 does not in reality control atmospheric temperature. Rather, it follows it. This is the range that was suggested around 30 years ago. For a science that gets heaps of funding and public exposure, it seems a little disappointing that we haven’t made much progress in this key metric. That is the unfortunate consequence of a nonlinear system. The bounds are well defined but not where we might end up within those bounds. Unfortunately there is no precedent in the paleoclimatic record. The models at the base of all scenarios have not been validated because they cannot be. All that follows is fraud, fraud,fraud. This has been admitted, but glossed over by folk whose admitted (we have their words) aim is the destruction of Western civilisation. It is known as Treason. BobD – Allmendinger’s expts show CO2 and Argon absorbing NIR at similar rates. Lab IR heating is more of the glass first….. Maxwell noted that the atmosphere acted differently and the Gas Laws rule via the Poisson relation (Theory of Heat). Shown by real experts from Woods to Klein (Mylar baloons to minimise container effects), to be true empirically. Yes, the school-level “experiments” conducted with coke bottles are completely wrong, for the reasons you mention. However, that doesn’t mean GHGs don’t absorb IR energy, they do. But the planet’s energy system is complex, and appears to be self-regulating. Energy will be lost, and there are several ways this happens, such that heat is not necessarily “trapped” in the atmosphere. Energy in will equal energy out, come what may. To me the point is that we have actual empirical evidence (Vostok) that CO2 cannot prevent heat escaping the planet. Therefore CO2 is not a strong regulator of the temperature of the planet. Other forces are much more powerful. In fact, it’s hard, from the evidence, to see how CO2 could even be called a weak regulator. It is completely powerless to prevent a sudden drop in planetary temperature. Greenhouse gases contribute roughly half of the glacial–interglacial temperature change. Bob, I have experimental evidence from Herr Allmendinger (qv) showing CO2 to absorb energy from NIR (more powerful than IR, and used for signalling by plants), at similar rates to the far more plentiful Argon. All such is instantly thermalised of course and expands at vast speed. The resultant buoyancy contributes with LH of water vapour to equipartition which bypasses the LT radiative soup to dominate return of energy to space. Gases are not solids, so the run under the gas laws and Poisson relation. ALL GASES. Because they have degrees of freedom and room to do so. Gas specie is irrelevant in this. Study of Maxwell’s “Theory of Heat” should be compulsory to all warmists (grin, some chance!). Also RW Wood, Berthold Klein -Mylar balloon expt, and Konrad Hartmann’s expts, also Allmendinger’s. Not to mention the small matter of how Quantum Oscillations happen (a very small matter). Such things could get them out of their suicidal rut. I can’t make’em, so the Darwin Effect must just take ’em out full stop. We just wish to save the innocent……..
Simon, above, might wish to demonstrate a physical mechanism if he can. From Tony Heller, what we predicted, the end approaches. Watch for the doomist “we will all freeze” claims again in about six months as AMOC cycles normally, and Quiet Sun conditions add to it. Yes, I do remember the last time round, from my sister in America. Insane. We were almost young then, in 1979. We have a huge collection of similar works, but you have to want to learn……. Most of those localised examples are from the mid-Holocene (6000-7000 years ago) which was quite warm. On average though, it is warmer today. Our current state is more analogous to the mid-Pliocene (3-4 million years ago). During the mid-Pliocene there was mixed Southern beech vegetation growing in coastal Antarctica. Coniferous forests extended far north in the Northern Hemisphere into areas that now support moss-lichen tundra or are Arctic Deserts. I think it is generally accepted that around NZ temps were on average 2-3degC warmer than present. (Now where did all that CO2 come from in the Mid Pliocene – 400ppm)? Volcanic action, Neanderthal fire lighting and weed smoking, and higher temperatures caused increased photosynthesis. Simple. I certainly am in irony. But I tried to locate them within the period of interest. I saw this chart that showed humans from 2.5 MYA. Our timeline has been pushed back a lot in recent decades, and Neanderthals would be earlier. 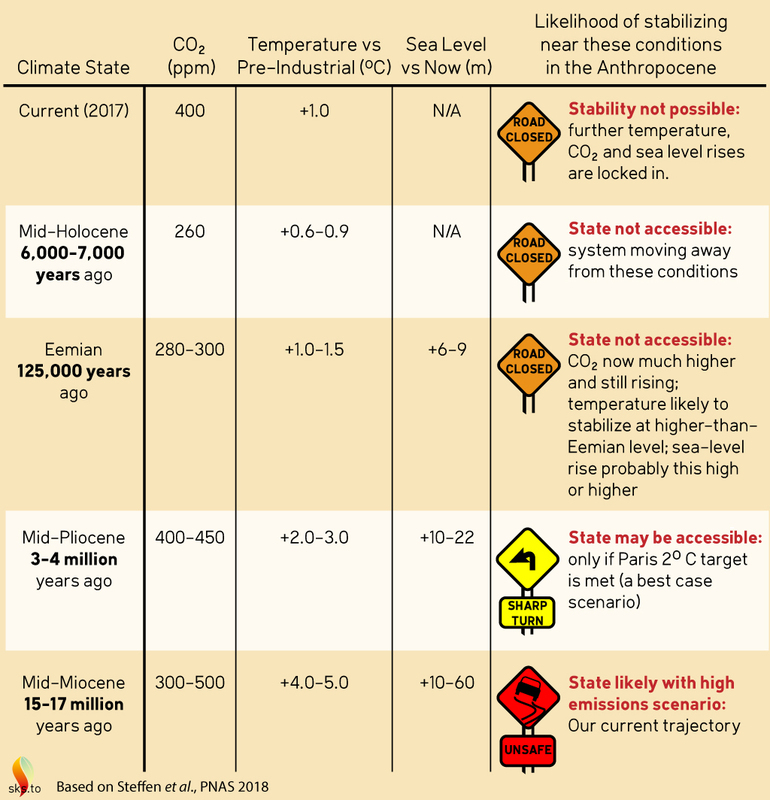 From this chart (my preference for geological ages) the Pliocene ran from 5 MYA to 2 MYA, thus nicely excluding humans. I thought that was enough. Apparently it may not have been, though Neanderthals must be pushed back as human evidence is found, so I may yet be right, though your reference is dated May this year. If I’m wrong, thanks for the correction. This is fun. It gets old fast when porkies keep being offered…. Not only mid-pliocene but every other peak including the last, MWP, were warmer than now. NZ has well-backed lakebed volcanic-constrained pollen sample proof. For instance. I will not make any wild claims about the now-started AMOC/Quiet Sun cooling, except that our foes will be doing so again. This time about warming causing cooling. Oceans are cooling by the day and, not having experienced before what is happening (solar drop in UHF- UV), I do not know yet. Hope we are wrong. Neanderthals may not have mastered sewing’ by which folk can be snug in the arctic now. But our direct ancestors did, and thrived in comparison. Just my tuppence worth. Mitochondrial Eve is, I believe, currently dated to around 130,000 years ago. Y-chromosome Adam dates to roughly the same age (130,000 years). Older genus-level variants (eg: Homo habilis or Homo erectus) are apparently not “anatomically modern humans”. Homo sapiens is the only surviving species from the Homo genus. From IPCC. It is a wavy downslope from 8-6000 BC, to now. No sign that will change outside of La La Land. Thanks for the explanation. There’s apparently a considerable difference between the ages of artefacts and DNA evidence. Just a month ago came this story of stone tools 2.1 million years old (if dating was accurate) in China. Then this story from 2007 reports early humans living on the coast of South Africa 164,000 years ago, “far earlier than previously documented.” Different and tantalising. All consistent. The “Adam & Eve” from DNA studies don’t preclude the existence of earlier humans, just not directly related to us I guess. According to “Out of Africa” ideas there were various migrations out of Africa over many years. A lot of speculation and competing theories though, I don’t know enough about it, but it’s certainly an interesting topic. I visited the “Cradle of Humanity” area in South Africa a few years back (cycling – we stopped for a snack next to a wire fence. Looking through it, we realised we were being watched by a pride of lions), and I remember as a kid going on a guided tour through the Sterkfontein caves, using only candles for illumination. Pretty damn scary. Tools of course were used by early hominids (not just humans) from much further back. I see what you mean. There’s evidence supporting both “Out of Africa I” perhaps 1.8 or 2.1 mya and “Out of Africa II” maybe 300,000 years ago. So both could be true: my curiosity is exceeded only by my bewildered ignorance. The Vedic scriptures describe four ages, together forming a “maha yuga” (Great Age) spanning, as I recall, 12 million years, and endlessly repeating, and seeing evidence of human life of this antiquity starts to hint of their veracity.